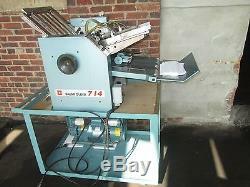 Baum Air Feed Folder Item Information : a.. Model 714 air feed serial - 37a197 110 volts. The Baum is a maximum sheet size of 14" x 20". The adjustable speed control allows a variety of material weights to be folded, and angular control adjustment of the entrance rollers insures a square fold consistently. Automatically feeds, folds, and collects a stack of documents. Bottom Airfeed allows for continuous reload of documents without stopping machine c.. Simplified adjustment for folding 8 1/2" x 11", 8 1/2" x 14", or 11" x 17" documents a.. Creates a variety of different folds: letter, half, z-fold, double parallel, baronial, French, and custom folds b.. Adjustable within a fold range of 1 3/4" to 13" on the 1st and 2nd fold to allow for customized folds c.. 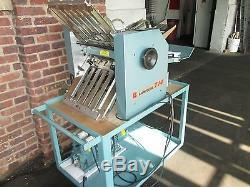 Operates at a variable speed of up to 18,000 sheet per hour d.. Handles sheet sizes from 3 1/2" x 3 1/2" to 14" x 20" e.. Handles paper from 9 lb. Onion skin to 110 lb. 43" x 24" x 19 1/2 g.. 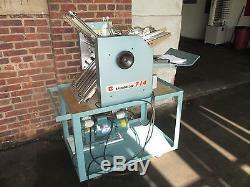 This machine will be palletized - shrink wrapped - banded for Free. All item available for local pick-up. Item Location 125 Lake Ave Staten Island NY 10303. You will recieve an E-Bay invoice within 24 hours. Item's can be inspected on site in staten - island n. All Sale's Are final As-Is Where-Is. Thank You for looking & happy biding. 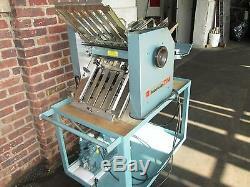 The item "BAUM FOLDER AIR FEED FOLDER 14 X 20 VERY CLEAN" is in sale since Friday, April 28, 2017. 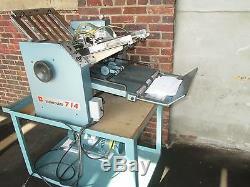 This item is in the category "Business & Industrial\Printing & Graphic Arts\Bindery & Finishing Equipment\Folders". 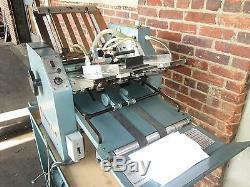 The seller is "yamitprint" and is located in Staten Island, New York. This item can be shipped to United States.